It's really not too early to think about Christmas. No, it's not. 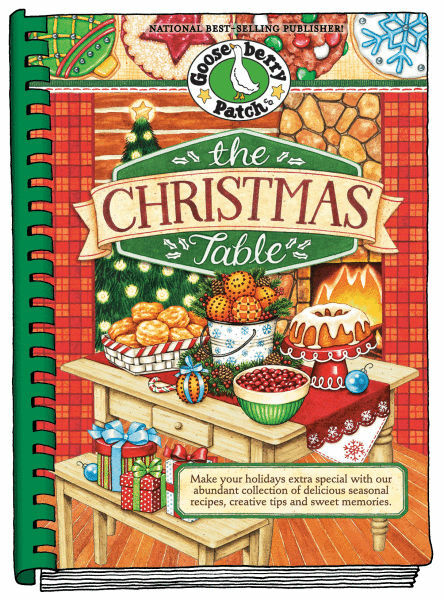 One of the things that I've always looked forward to year after year is the release of Gooseberry Patch's Christmas cookbook. What will the title be? How will the cover look? What Christmas memories will be shared? And which recipes will I try first? Well, it's here and it's called The Christmas Table and this is what it looks like. Nice and festive, right? I think so, too. And, of course, it's filled with wonderful recipes, helpful entertaining hints, and heartwarming memories. Here are the titles of the chapters: Cozy Christmas Brunch, Chill-Chasing Soups and Breads, Caroling Party Supper, Classic Christmas Dinner, Festive Holiday Fare, and Sweet Treats to Share. With recipes with titles like Sugarplum Bacon, Winter Artichoke Soup, Red Flannel Spaghetti, Grandma's Chestnut Stuffing, and Peppermint Marble Cake, you'll forget all about the hot days of summer to come and will start counting the days until you'll pulling out your Christmas decorations. I chose a few recipes to share with you from Caroling Party Supper, Festive Holiday Fare, and Sweet Treats to Share. You don't have to wait until winter to try these. They can be enjoyed right now in the heat of spring. In a saucepan over medium heat, melt butter. Add onion; cook and stir until tender. Add remaining ingredients except chicken. Heat to boiling; reduce heat and simmer for 10 minutes, stirring occasionally. Arrange chicken pieces in an ungreased 13"x9" baking pan; spoon butter mixture over top. Bake, uncovered, at 350 degrees for one hour and 15 minutes, or until juices run clear when chicken is pierced. Serves 4. In a bowl, beat cream cheese and butter until smooth. Add powdered sugar, brown sugar and vanilla; blend until smooth. Stir in toffee bits and chocolate chips. Refrigerate mixture for about 30 minutes, or until it starts to firm up. Remove from bowl; spoon mixture onto a sheet of plastic wrap and form into a ball. Wrap tightly; refrigerate overnight. Before serving, unwrap ball and press pecans into the ball, if using. 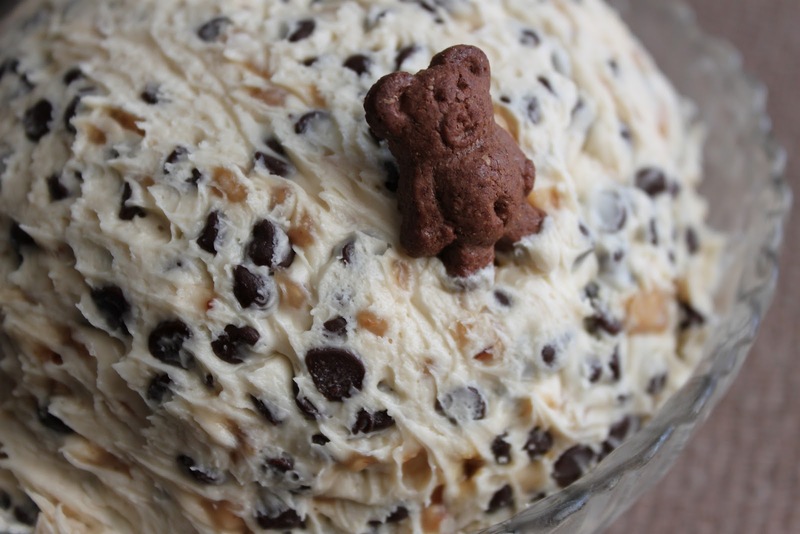 Serve with graham crackers or apple slices. Serves 10 to 12. In a large bowl, beat butter and shortening with an electric mixer on medium speed for 30 seconds. Add remaining ingredients; mix well. Cover and chill dough for 3 hours. On a lightly floured surface, roll out dough to a 1/8-inch thickness; cut into desired shapes with cookie cutters. Arrange on ungreased baking sheets. Bake at 375 degrees for 7 minutes, or until golden. Makes 2 dozen. Do you think that you would like to have an early Christmas this year? Would you like your very own copy of The Christmas Table? I have an extra one to share with you. It's easy to enter the giveaway. Be one of my blog followers. Leave an e-mail address where I can reach you if you're the winner. Disclaimer: The publisher provided me with a review copy of this cookbook, but the opinion expressed here is my own. Oh...and I follow your blog. I'm very interested in the cookbook! Thank you. I'm a follower and I'd love to win a copy of this great cookbook. I don't share my email address publicly, but I'm easy to get a hold of through my blog if I happen to win. Thanks for understanding. PS - I've got to make that turtle cheese ball. Wow. I love Gooseberry Patch cookbooks and deals. I collect Christmas cookbooks; recipies; pictures, etc. I always want to do bigger, better next year. I start planning in Oct. I would love the opportunity to win a GBP cookbook... I use there cookbooks more than anything else!! My email is luv2teech71(at)hotmail(dot)com. Thanks so much!! I found your blog through Gooseberry Patch on Facebook! I'd love a chance to win the new Christmas cookbook! Thank you so much! I really love GBP and would love to own this book. My email is dragonfly9202000@yahoo.com. Thank you. I love cook books, but I'm new to gooseberry, and do not have any of your cook books!!! I Love Christmas...and what better way to start then with this beautiful book..Id LOVE to win it!!! Thank you so much for the opportunity to do this..My e-mail is.. I'm following your blog also, and enjoy all of your great recipes. It would be wonderful to receive this awesome Gooseberry Patch Cookbook! I've had a few of my recipes posted in their books, in past years. Always enjoy them! Thanks so much for offering this giveaway too! I love following your blog!!! Especially the sneak peeks at the upcoming new cookbooks. That BBQ chicken recipe and Turtle Cheeseball look delicious! I have been collecting your cookbooks for years. My girls love to take them down and look at them (even though they are only ages 9, 7, and 4). I would love to have this new cookbook to add to my collection. My e-mail address is harndee@charter.net. Thanks! love your cookbooks. I would like to receive The Christmas Table. I love my Gooseberry cook books, especially the Christmas one. There are so many great ideas in the Gooseberries. Love it. I just signed up to follow your blog...at least I think I did. Hope I did it right. Happy to find this site. I read today "Ask for what you want, and be ready to receive it." :-) I'm ready! To receive the new Gooseberry Christmas book! Thanks. Will be visiting your site to see all the recipes. I love my previous Gooseberry cookbooks and the Christmas one would make an excellent addition to my collection! Plus I just really love to cook! Love new cookbooks and getting new ideas to cook for my family. This is my first visit to your site, but I will gladly follow!! I also followed you on Pinterest!! I can't cook unless I am following a recipe, so I would love to win a new cookbook!! I love my Gooseberry Patch books. The part I love e most are the heartfelt stories. Whenever I get a new book I sit and read it from cover to cover before I use 1 recipe. I love the tips and stories as much as the recipes! My email, Deana@lemkepc.com. I just checked your 'follow this blog' tab and look forward to viewing your blog. I would love to win this cookbook. I have the very first Christmas cookbook that GP published and each subsequent edition. I love them. I love what I see on your site. Well done. Ooooohhh, I love Christmas recipes. I'd love to win this cookbook. I would live to win this cookbook. Could use a little cheer right now. Love love love gooseberry patch cook books! follow your blog...enjoy your cookbooks...good reading and good recipes...nicely illustrated, too. I am writting this because I LOVE all your recipes. when i first heard of you and saw all the great recipes I knew i found a new love of food. I think its the best that you also give free or .99 ebooks. So much easier and better on my wallet. I saw the chirstmas book and i would love to win that. My husband would like it to since i didnt have to pay for it. Thank you for all the wonderful recipes. i am very interested in the cookbook. what a treat! I love collecting and trying recipes from cookbooks. Christmas is my favorite time of year!! 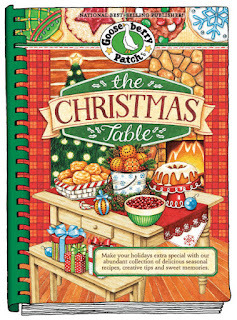 I would love to add this Christmas Cookbook to my collection of Gooseberry Patch cookbooks!!!! I follow you on FaceBook...Luv, luv all you blog.Starting new Christmas traditions since I lost my brother & my Mother this year. Thanks for the opportunity to win a copy of your book. The Turtle Cheese Ball sounds wonderful! Can't wait to try it! I will definitely be following your blog! I would love to win this cookbook, and thanks for the recipe shares! Hey, you girls have been getting alot of hits,,lol,,good for business. I do confess, I do so ever look forward to your new releases. The Turtle cheese ball sounds like a big hit. include me in. I love christmas and love cookbooks!!!! Would be so excited to get this new cookbook!! I read your blog regularly and I would love a chance to win this cookbook! Thanks for sharing the new GP cookbook! Christmas is a special time of celebration. Thanks for the opportunity to win cookbook. You can always find great recipes in a Gooseberry Patch cookbook. I've always enjoyed your Christmas editions. I love Gooseberry Patch cookbooks...all the recipes are great. Thanks for the opportunity to win a book. Following on your blog too. I love Gooseberry Patch cookbooks not only for the great recipes but also all the warm thoughts and memories included in your books! This would make a great addition to my collection! I love your blog and Gooseberry Patch and would love to win this cookbook. I agree with everyone on the Turtle Cheese Ball. Can't wait to make it. Another great cookbook giveaway! Thank you, Kim. I would love to add this one to my collection! Love your blog and facebook site, also big fan of Gooseberry Patch and love Christmas, especially cookbooks. Gooseberry Cookbooks are like a big ole plate of comfort food...spring, summer, winter or fall. My favorite thing to do is make a fresh brewed cup of coffee & sit in a comfy chair with a new Gooseberry Patch Cookbook! I have given your cookbooks as gifts for too many years to count - and they are much loved in my home! I would love to win this new one! I love my Gooseberry Books. Would love the new cookbook. I will try these recipes. I'm going to make the chicken tomorrow night. Can't wait to try the other two recipes as well. Love the cookbooks would love a copy of this one. Extremely interested. Thanks for the amazing recipes! I have some of your first cookbooks. Would love to add this to my cookbook colllection. Can't wait to try the BBQ chicken! I would love to win the cookbook. I have many of your cookbooks and I love Christmas cookbooks best. Thanks fot the chance ! I follow you on GFC. Would love to win the cookbook. Yay, Love the Gooseberry books. I have just become an addict to these books and cant wait to see this one! Thanks for the opportunity to win one! I am now a follower of your blog!!! I have been collecting Gooseberry Patch Cookbooks for quite some time and I LOVE their cookbooks!!! I would love the opportunity to add this one to my collection! 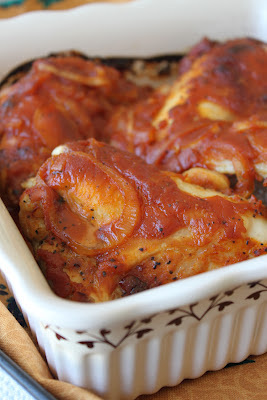 I can't wait to try the Oven-Barbecued Chicken, you shared from the book....looks yummy! It looks fantastic! I get the Christmas books every year! I'm new to this site and I would love to win a cookbook. Reason. I instantly fell in love with your site. First love feeling. Off to read some more. I will spend hours here today. I am a blog follower.. I would love to win. I love these cookbooks! WOW I would LOVE to have the new Christmas cookbook! I would relish every page and share the fruits of the recipes with my family, friends and neighbors! This is very exciting to me. My email address is jean.c.gustafson@gmail.com and thank you for your wonderful emails, recipes and tips! I have many of your cookbooks but I would love to add the new book to my collection. My e-mail add is: RayNSue2002@aol.com. I would love to add this to my cookbook collection - Gooseberry Patch is the best! Your videos are great! I would love to win the Gooseberry Patch Cookbook. I have enjoyed the craft books also! My email is rue@hickorytech.net. Thank you! Did I already apply to this. I start Christmas January of every year. It is a must deal for me. This cookbook will get me right back into spirit that I actually never lost. Life is good. Do we have to put our email address for everyone to see. oh well. bjdw00@cox.net. I love,love your Gooseberry Patch Cookbooks. I look every week on Amazon.com to see if you have any new ones out. I don't have an actual cookbook mine are all my ipad, so I would really really love this one. My email is pkb0o0803@aol.com. Thank you. I love your Gooseberry Patch Cookbooks. I am now a blog follower!! Looking forward to all the great recipes! I would love to win A Christmas Table by Gooseberry Patch....Gooseberry is the best! I LOVE Gooseberry Patch cookbooks. I really would like to win this one for myself. I am a follower of your blog (and I'm sorry I forgot to say that on the comment I left on your other GBP cookbook giveaway). younghomemakers@inbox.com. Would love to win this Gooseberry Cookbook! I follow your blog and FB page. Would lovethe cookbook!The recipes look great!! I am a NEW follower, I would love to have the book. Goose Berry Patch cbs and don't have this one. I have about thirty or more of your cook books but do not have The Christmas Table. Would love to add it to my collection. This Christmas book would go very well with the Christmas dishes and mugs that I picked up at a yard sale this morning! I am a follower of your blog! Love Gooseberry Patch cookbooks. This would be a great collection to my cookbook library! Thanks for a great giveaway! Am a blog follower and "like" you on FB. Thank you for having the cookbook giveawa! I'd love to win! Wow, Love this giveaway and Love Gooseberry.....and I could never get enough of Christmas....so it is a great combo!! I follow you on facebook! Love your recipes! I would love this Gooseberry Patch Christmas cookbook! It would be great to add it to my collection. 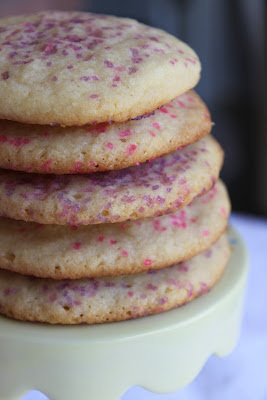 Love your blog...lots of yummy recipes and interesting articles. I, also, really like Gooseberry Patch recipe books and would love to add this to my collection. In fact, if I won this it would be my FIRST Gooseberry Patch recipe book. Keep up your great blog. Pam Jones at grammiepammie@sbcglobal.net Thank you! I follow your blog and would love to add this gooseberry patch cookbook to my others! Rga491@aol.com thanks!!! We love Gooseberry Patch recipes but don't have any cookbooks yet. We are always looking for new things to add to our everyday lineup. Love Gooseberry Patch and would LOVE this book. Thanks for the opportunity!! I Want the cookbook!!! Gooseberry Patch is the best! Thanks! My email is MLJPATRIOT@AOL.com HAPPY MOTHER'S DAY EVERYONE! I love Gooseberry Patch cookbooks and would love to win this one! I'm a new follower! This book looks fantastic! Love having photos to go with the recipes. Love your blog! I would love to add this to my other Gooseberry Patch books of all sorts. Last year we had the chance to download some of the Gooseberry Patch recipes and they have become some of my favorites to make for my sons. My adult sons are not easy to please, so I was grateful for these recipes, I would like very much to win the cookbook for Mother's Day! Good luck to all who have entered. Thank you. I follow you on your web site and you are at the top of my favorites list. The three recipes you shared sound yummy and I will be trying them very soon. I would love to receive a copy of your cookbook and look forward to many more great recipes to make for my family and friends! Do I follow you? I think I may be a stalker!!! lol.. I would love to win this Book. I love everything to do with Christmas! I'd love to win this cookbook. I'm a follower on Facebook and subscribe to your emails. I love GP, and those recipes look great. Would love to win it! I would love love love to win this cookbook. I'm a follower on your Facebook page and also I am subscribed to all your Gooseberry emails. Gooseberry are the BEST cookbooks.. And then add Christmas to the list,,,, nothing better. Would love to add this to my ongoing GP cookbooks. I am a gooseberry patch junkie. I need this book for my enormous collection. My email is cathynsudkamp@gmail.com. I love Goosberry Patch, I only have a couple small cookbooks and would love to add more to my collection. I would love to have this book,I love cookbooks and especially a Christmas book. I have just recently discovered Gooseberry Patch and would love to have a recipe book. This would be perfect since I love Christmas books! ansleyrc at gmail dot com. (Hope this style qualifies as an email address). I would follow you anywhere. Christmas is my favorite holiday and nothing is prettier than the Gooseberry "down home" pictures that take you back to a simpler place and time. I would love some delicious recipes for the season and Gooseberry always has them. Please reach me at burgodebbie@yahoo.com and thank you! Would love to win this cookbook! :) Yes, I follow your blog! I am getting hooked on the Gooseberry Patch collections and would love to have this book. I am always looking for new Christmas ideas and also ways to streamline for a better, more meaningful Christmas. My email is: fran1key@cox.net. Hi! I follow your blog, and would love to win this Gooseberry Book!